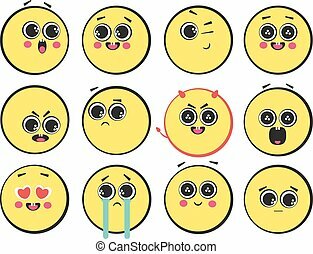 Yellow smileys faces icon and emoticons with facial expressions and emotions in flat paper cut circle. Vector illustration. Smileys vector background. 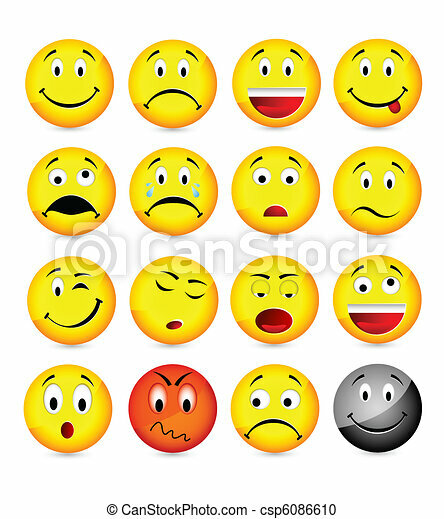 Yellow smileys or emoticons with funny and happy facial expressions in empty blank red background for text. Vector illustration. Yellow smileys vector background. 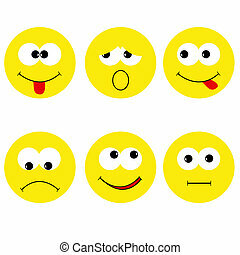 Emoticons or smileys with funny and happy facial expressions in yellow blank space background for text or presentation. Vector illustration. Happy smileys vector icon set. Joy emoticons pictograms collection. Happy round yellow smileys. Large collection of smiles. Happy smileys vector icon set. Joy emoticons pictograms collection. Happy round yellow smileys. Laughing, joyful, in love, cheerful, mischievous and others emoji face. Smileys vector icon set. Emoticons pictograms. Happy, merry, singing, sleeping, ninja, crying, in love and other round yellow smileys. Large collection of smiles.